Very crisp like meringue cookies but way easier to make!!! 1. Preheat the oven to 248F (120C). 2. Line the baking sheet with parchment paper. Cut marshmallows into quarters using kitchen shears and place them an inch apart. 3. Bake at 248F (120C) for 15 minutes. 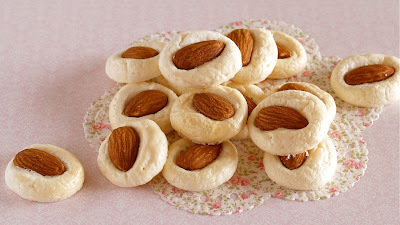 Remove from the oven and quickly press in the almonds while the marshmallows are soft. 4. Bake again in the oven at 248F (120C) for 45 minutes. Leave to cool in the oven for about 15~30 minutes. They are perfectly crisp when they are slightly golden, so remove from the oven to cool then.